Posted on May 7, 2012 by Sandi. This entry was posted in Food, Lifestyle and tagged chefs, favorite chefs, giveaway, surveys. Bookmark the permalink. 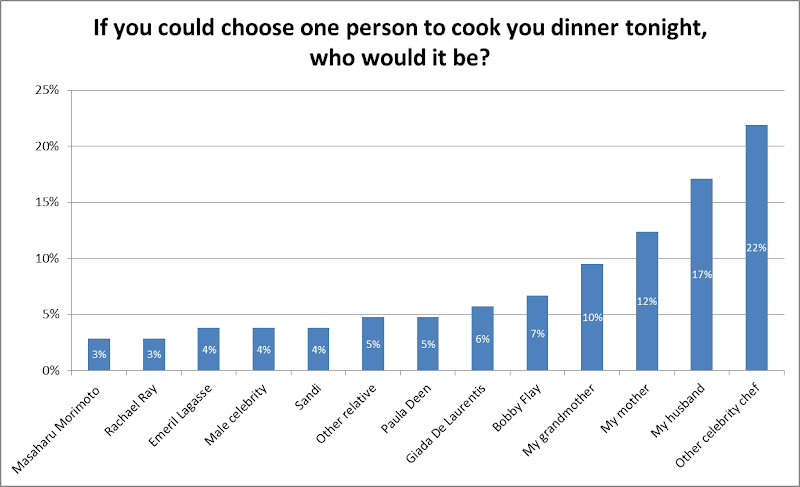 Mmmmmm…interesting statistics, I am also amazed at the high number of votes for husband! I know! Could they all be married to Michelin star-rated chefs?!? The husband votes surprise me, too! My husband would totally cook for me every night — but I don’t let him! I like to cook. It’s my time to unwind and clear my head, and I enjoy it too much to let go of it. hmm. Ha, I like cooking but I’m happy if someone else wants to take over for a night! I agree, it’s a great way to decompress — though when not totally decompressed yet I have been known to slice off a fingertip or two :(. ouch! me, too. or, more likely — because i was drinking wine while cooking…..